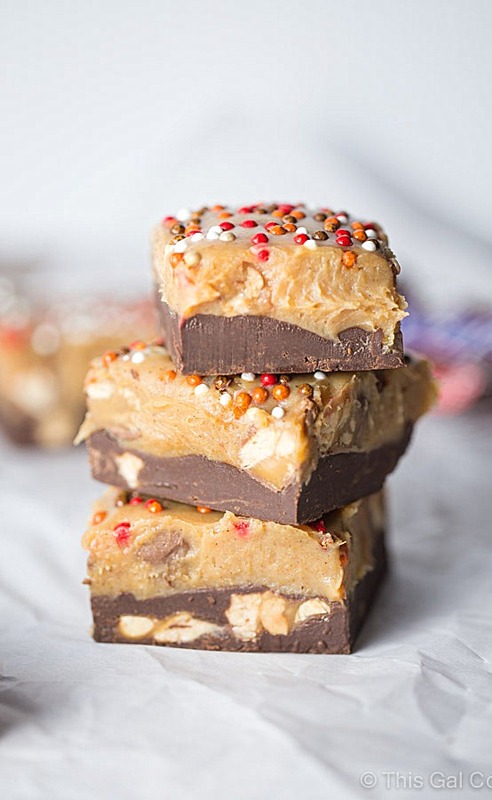 Snickers Chocolate Peanut Butter Pumpkin Fudge is two layers of creamy, dreamy fudge filled with chopped snickers bars that you’ll want to stuff your face with. It’s so easy to make, too! Yesterday I shared this Creamy Bacon Ranch Pasta Salad. I mentioned a fudge recipe that I made with some of the candy I had leftover from Halloween. You were waiting for that fudge recipe, weren’t you? Guess what? This is the fudge recipe I was talking about. 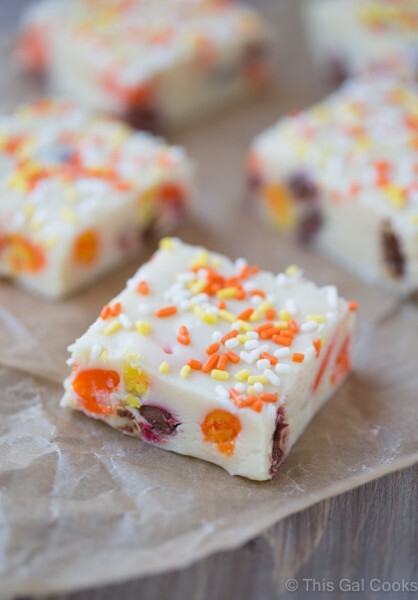 Ever since I made this Candy Corn M&M White Chocolate Fudge, I’ve been dying to make fudge again. On Sunday, I went to work in my kitchen and created this fun Snickers Chocolate Peanut Butter Pumpkin Fudge recipe. A few items on my list of favorite things in life include chocolate, peanut butter, pumpkin and Snickers bars. So it’s no surprise that I decided to make fudge with all of those things. I was afraid this fudge wasn’t going to set as it took much longer to set than the previous fudge recipe I made. But in the end, it decided to firm up so I could devour it’s fudgy-ness. A word of advice on the sprinkles – if you opt to top your fudge with sprinkles, don’t use the type I used. They are hard and crunchy and my weird-texture-hating-self did not like them. As I mentioned above, the fudge does take a while to firm up. And once firm, the top layer is pretty soft. It’s best to keep this fudge refrigerated at all times, unless of course you’re stuffing your face with it. OH and one more thing before we get to the recipe. Bear with me on the photos. I know they aren’t the best. But Daylight Saving Time ending means I’ll be breaking out the Lowell Ego light a lot more. Fudge and artificial light didn’t want to be best friends for this photo shoot. But that’s ok. The recipe is too good not to share! 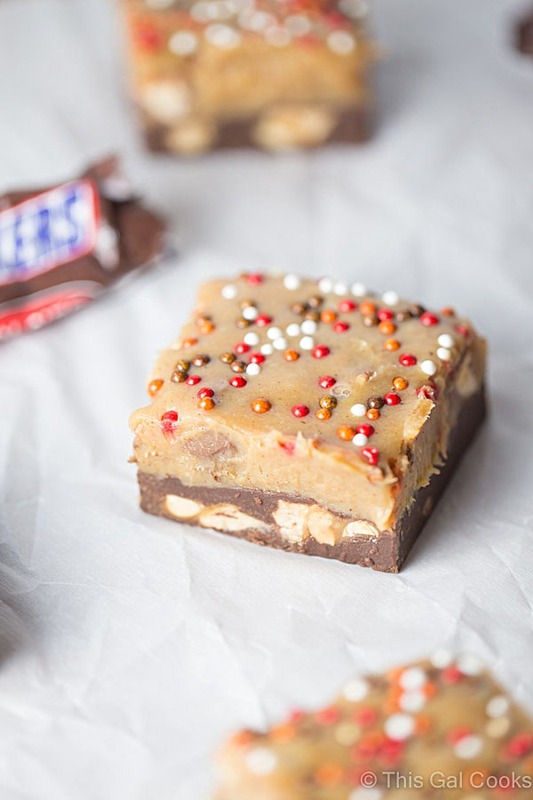 Snickers Chocolate Peanut Butter Pumpkin Fudge is two layers of creamy, dreamy fudge filled with chopped snickers bars that you'll want to stuff your face with. It's so easy to make, too! Sprinkles for topping, if desired. Line an 8x8 baking dish with foil, ensuring the foil hangs over the edges of the dish. This makes for easy removal from the dish. Lightly grease with cooking spray. Wipe away any excess spray with a paper towel. In a sauce pan, combine the semi sweet chocolate chips and half of the sweetened condensed milk. Heat over low and stir often until melted. Remove from heat, mix in half of the vanilla extract and then half of the Snickers. Pour into the prepared baking dish and refrigerate for 10-15 minutes. In another saucepan (or clean the one you just used and use that), combine the white chocolate chips and the remaining sweetened condensed milk. Heat over low and stir often until melted. Once melted, mix in the remaining vanilla extract, the pumpkin puree and the peanut butter. Mix well and then stir in the remaining Snickers. Pour over top of the chocolate fudge layer. Top with sprinkles, if desired. Refrigerate for 2-3 hours or until firm. Lift the fudge from the baking dish by pulling up on the foil. Cut into squares. Store fudge in a fridge until ready to eat. Try my Candy Corn M&M White Chocolate Fudge. 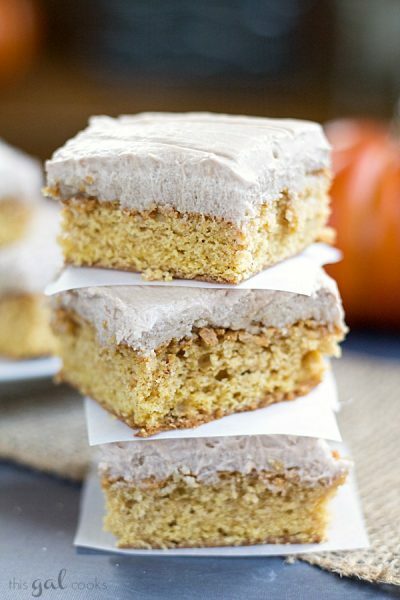 Or these Pumpkin Snickerdoodle Blondies with Nutella Cream Cheese Frosting. Tired of pumpkin? 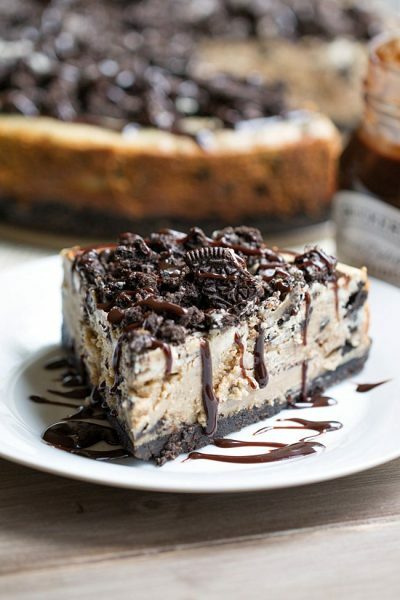 Try this Peanut Butter Oreo Cheesecake. It’s Sooo good! Haha, I see we both share a love of Snickers! Great minds… ;) This looks fabulous Julie! Even though you didn’t like the sprinkles, they sure do look cute. 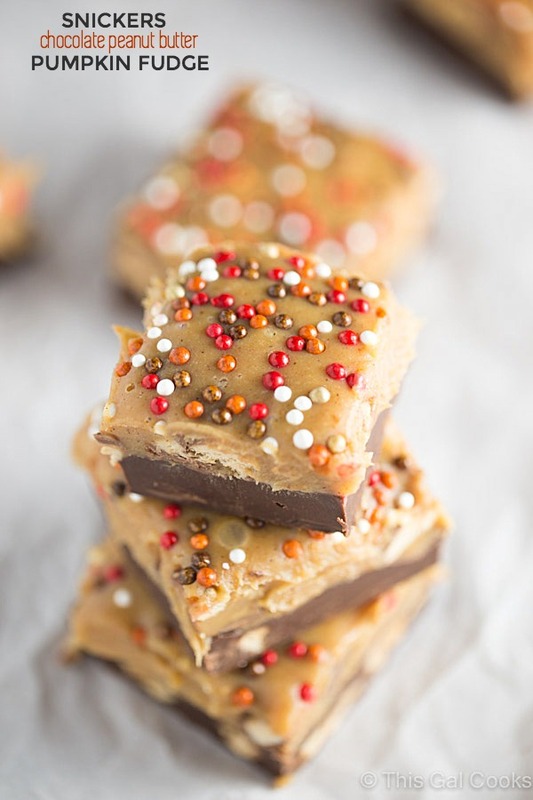 This is such a unique use of leftover candy — I currently have about five pounds of leftovers as we had ONE trick-or-treator, so these might have to make an appearance! Ah, we fared a little better with the trick-or-treaters – we had SIX! So I still have tons of candy leftover. I’m already thinking of other treats to make. :) Thanks for stopping by, Nicole! This fudge is totally calling my name!! Stop it! You’re gonna have me making fudge at midnight again tonight! Ohhh if you make fudge, I can’t wait to see what kind you make. Cause that Dr. Pepper fudge that you made looked so good! These are just beautiful and have SNICKERS!!! I am in love! Hi, Julie … I love that you developed a fudge with all your favourite things in! I do that kind of thing with dinner quite a lot, but unfortunately my ‘likes’ don’t always match up with hubby’s, so I have to compromise sometimes and not do that all the time! I have that problem with dinner, too. My boyfriend will eat most everything but I’ve found that he is not fond of some of the foods that I enjoy. With the time change, the lighting in my house is not where it needs to be when I actually am ready to photograph. I do like the Lowell Ego but it definitely isn’t the same and when I look at the photos, I feel like I can tell they are not natural lighting. Gah! I do feel like I have to get closer into the photos or have the light right on top of them. I only have one light as well! I have to edit a lot in Lightroom with the artificial light. Not only does that fudge look totally decadent – but these are so so pretty too! What a beautiful fudge recipe, Julie! I love all those sprinkles on the top. So pretty and cute!!! Pinned!! Thank you for the compliment and the pin, too, Olivia! I think I need to start a new bookmark folder entitled “Julie’s fudge recipes to make before Dec. 31” because I am drooling over here! Pinned! This fudge is gorgeous, Julie! Snickers, pumpkin and peanut butter? Swoon! Love the pretty sprinkles too! This fudge is gorgeous and has all of my favorite flavors! And these pics are gorgeous girl! Nice work. These sound AMAZING! And the photos are beautiful! Daylight savings is going to be problematic, that’s for sure! I haven’t photographed anything yet because I’m out of town, but I know it’s going to be a struggle! Haha. These look beautiful though and sound incredible! Isn’t if funny how some recipes do that to us – make us want something we don’t even like?! This fudge is seriously everything! Wow!